If you consider yourself a lucky woman or want to put you luck to the test then take a look at the brand new Lucky Ladies Bingo. 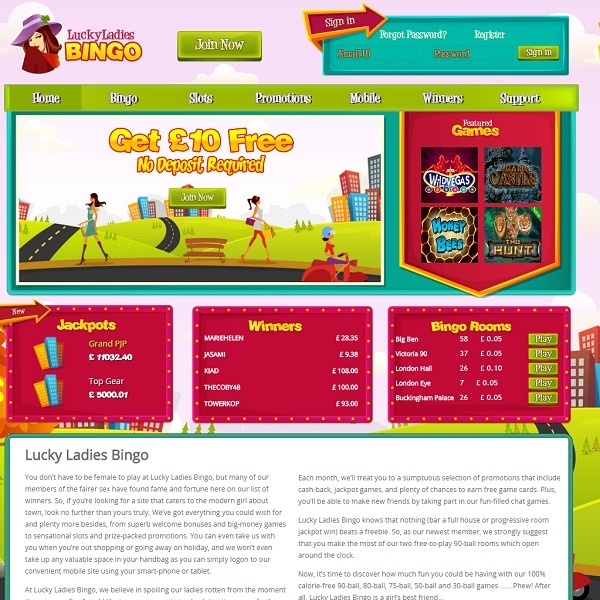 Lucky Ladies Bingo is based upon Cozy Games software and offers players 30, 75, 80 and 90 ball bingo. There are games taking place every few minutes in a large number of rooms and many of them offer substantial prizes. Best of all there are regular free bingo games taking place. In addition to bingo members can also enjoy slots, video poker, card and table games, keno and scratch cards. All new members will receive a £10 free no deposit bonus followed by a 500% first deposit bonus. There is also a 350% second deposit bonus and a 300% third deposit bonus as well as numerous other promotions being run all the time.